Character and general events: He is liable to face several obstacles in his life. Even then he has special aptitude to handle the most difficult situation in a systematic way. However, if we look at his face, a peculiar frustrated face can be noticed. The main reason for such a gloomy appearance is the problems, which he has to confront on several occasions. To be more specific, he will find his peace of mind missing in his life. Even the smallest of problems will start pinching as his mind repeatedly runs after one and the same problem. He always thinks of taking revenge waiting for the right opportunity. In spite of these drawbacks he is the most hardworking person ever ready to complete the tasks set out for him. Come what may, march forward is the motto of this native. Here I may add that after several reversals he ultimately achieves the desired result. He is a firm believer of god. He cannot keep a permanent stable relationship with anybody. His life is full of helplessness but independence. Even in severe adversities he will not leave optimism. 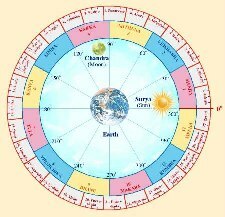 Anuradha Nakshatra: Spread from 3:20' to 16"40' Vrscika Rashi. Lord is Mang al, Symbol - the same as that of Visakha. Visakha and Anuradha are complimentary to each other. From Anuradha is derived friendship, love, affection and other tender feature of a person's character. From Visakha is considered the ultimate objective while from Anuradha is indicated the 'action'. The difference between Visakha and Anuradha is that while the Visakha-native forgets after success about benefits derived as also the persons who helped, the Anuradha-native retains soft feeling about them, he keeps his friendship intact and does not forget the benefits. The Anuradha-native's mind is always alive and receptive to all feelings and gestures of friendship and love. He is like the sentinel always a mounting guard over emotions, but lacking the hardness or toughness of the official sentinel. Those born in the star Anuradha are interested in women, with commendable complexion of the body, bewildered, idle and weak minded. They are famous, experts in arts, and destroyers of their enemies. They are servers of king, brave, stationed in countries other than their own, handsome, and destroyers of their sins. They are truthful, respect kings, respect their mothers and are musicians. They enjoy life and go after other women. They are fit for friendship, kind hearted, of helping nature, intelligent, enjoyers and travellers. My nashatram is Anuradha. I bought blue topaz ring.i wanted to know good time to wear this month. i am totally shocked this is 100% correct my life also showing this things. thanks ,every single details is correct .As i belong to anuradha nakshatra . Amazing to found you, i am just like the same you printed.Thanks for this. just now i saw this site and checked anuradha nakshatra characteristics and found 99% correct. Now I am 54 years, I checked all above mentioned characteristics from my child hood to till-date. things about anuradha nakshatra is accurate' agreed with the above written Characteristics!! Your astrology is excellent. I just read my star natives and it is found that it is absolutely correct.